The following review was conducted in January 2011, and information on subsequent software updates and new version releases may not be reflected within. This review predates OnSIP’s desktop app, free to OnSIP users, so is not affected by bias. A more recent review of this phone can be found here: Bria for Mac (version 4.0). We tested video calling with the initial release of Bria (v3) and experienced some pretty severe frame rate and video-quality issues. Counterpath has since upgraded the softphone to version 3.1. The video call-quality issues have been resolved. The following review was conducted in July 2015. Bria for IPhone version 1.1.0 adds iOS4 multitasking and the inclusion of multiple accounts to the feature list. iOS4 multitasking allows users to receive calls with the application running in the background. It also allows users to remain on a call while browsing their other apps, which might come in handy at times. The following review was conducted in June 2012, and information on subsequent software updates and new version releases may not be reflected within. This review predates OnSIP’s mobile app for iOS and Android, free to OnSIP users, so is not affected by bias. Bria for iPad is a software phone and unified communications application that combines high-definition voice, video, presence, and chat all into a smooth and easy-to-use UI for when you're on the go. 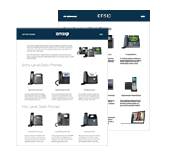 Users can add their OnSIP credentials to get extension to extension dialing and have their business caller ID displayed on outbound calls, allowing them to work from anywhere with an Internet connection. Premium features include presence management and messaging (SIP SIMPLE and XMPP), as well as video calling.